Getting back on track.....For today's challenge, my card base is Parchment designed card stock of unknown origin. I also used a brown card stock scrap to frame the sentiment card....My card is accented with pieces of card stock by K and Company - Christmas Cheer Stripe Foil Paper and October Afternoon - Peppermint Sticks. 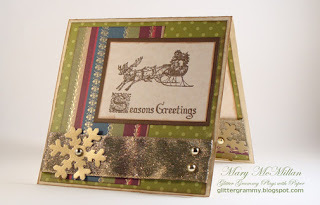 The gold snowflakes were cut using my Sizzix Sizzlit Snowflake die and the center of the snowflakes are gold metallic Dew Drops. The ribbon is from a ribbon I saved from a gift I received (gotta love recycling). I don't know about you, but when I craft, I think about memories from my childhood, and of memories my children created for me. I think about friends and how precious each one is and of people who have slipped into and out of my life, but while passing through left wonderful memories. The "Season's Greetings" sentiment brought a great memory. My mom always decorated the house...every space was filled with some little knick knack. Every year something new or different would be added. On one particular Christmas, my mom decorated the living room closet door with beautifully colored foil. She carefully traced and cut letters to express the joy she felt for this special season. (Yup....tracing and cutting....For you young people this was the way lettering was done before the BossKut Gazelle and Cricuit were born)... We all loved my mom's door and the shiny paper and the beautiful lettering. We were so taken with it's beauty it took us weeks to realize there was a tiny spelling error...My mom spelled Season's Greetings..... "Sesson's Greetings". That memory is from the mid-60's... What is best about the memory, we all remember it and we all talk about the Christmas door. Though my mom and dad have passed away, as has one of my sisters and one of my brothers....they all remain with us because of the memories created as part of every day life. When you share something you've created, you are sharing yourself and you are creating a memory of you. Happy creating. Happy memory making....see you soon!